Nimitz took command at a decisive moment, at the beginning of the war against Japan. The Pacific Fleet had a key role for the U.S. war effort in the Pacific during World War II. 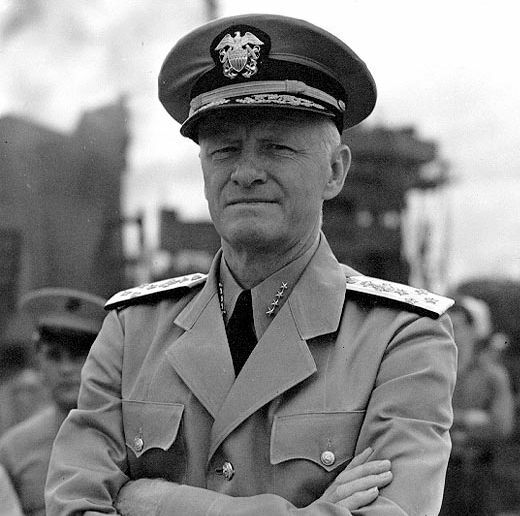 On this day in 1941 U.S. admiral Chester W. Nimitz took command of the United States Pacific Fleet. This occurred around three weeks after the famous attack on Pearl Harbor. Due to the catastrophe the Pacific Fleet suffered in that attack, its commander, admiral Husband E. Kimmel, was relieved of duty. Nimitz’s promotion ceremony was held on the deck of the submarine USS Grayling (SS-209). Nimitz was simultaneously promoted from rear admiral (a two-star rank) to full admiral (four stars). Thus, Nimitz never held the rank of vice admiral (three stars). Of course, Nimitz took command at a decisive moment, at the beginning of the war against Japan. The Pacific Fleet had a key role for the U.S. war effort in the Pacific during World War II. It is interesting that Pearl Harbor, Hawaii, has remained the main base of the U.S. Pacific Fleet to this day. Admiral Nimitz remained its commander until the end of World War II, and was later given an even higher position – that of Chief of Naval Operations. That is the highest rank in the U.S. Navy, and today it automatically makes the bearer a member of the Joint Chiefs of Staff.